As mentioned previously, from 1964-1969, all attempts to move the CoP to provide the resources necessary to transform the AJCSJ into an effective national organization came to naught. What did change during those years was the number of grass roots Soviet Jewry councils, which grew from 2 to 8. (Since my NASA responsibilities entailed periodic travel to both coasts, in my off hours I was able to meet with and assist the leaders of the emerging councils. In this way bonds of friendship and trust were established all around.) By the beginning of 1970, six councils concurred that the time was ripe. They would wait no longer for the ‘Jewish establishment’ to get its act together but unite to form a national confederation. 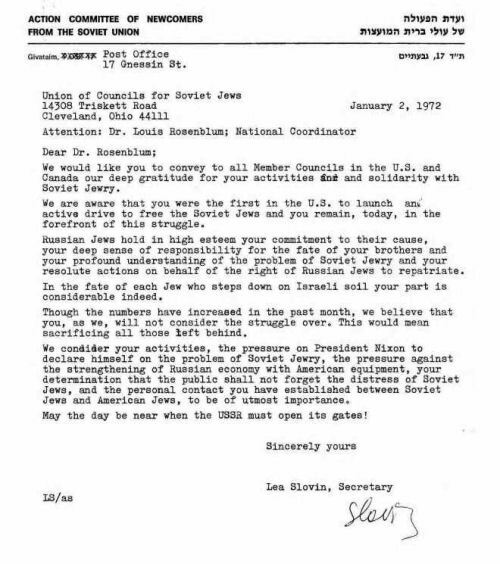 On April 6, the Washington Committee for Soviet Jews, the Southern California Council for Soviet Jews, the California Students for Soviet Jews, the South Florida Conference on Soviet Jewry, the Bay Area Council on Soviet Jewry, and the Cleveland Council on Soviet Anti-Semitism jointly announced the formation of the Union of Councils for Soviet Jews (UCSJ). Two grass roots organizations — the Student Struggle for Soviet Jewry (New York City) and the Minnesota Action Committee for Soviet Jews — opted not to affiliate formally with the UCSJ. Nevertheless, throughout the 1970s and 1980s, they worked hand-in-hand with us on several national projects. 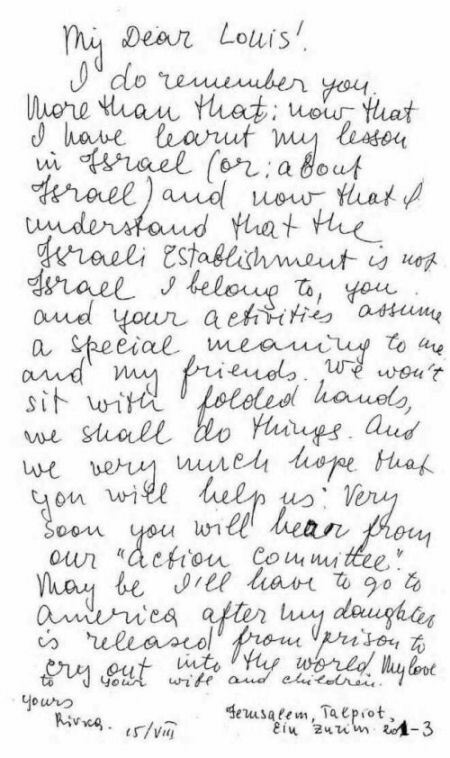 Also, during the early 1970’s we had two indispensable Israeli associates: Ann Shenkar and the Action Committee of Newcomers from the Soviet Union (ACNSU). Ann, a Clevelander by birth and upbringing, made aliya to Palestine prior to the formation of the State of Israel. She was the principal English language editor and overseas distributor of the News Bulletin on Soviet Jewry issued by the ACNSU. The News Bulletin consisted of breaking news and other vital information gathered through phone conversations with Jewish activists throughout the USSR. The Aleksandrovich family of Riga, Latvia — Rivka and Isaac and children, Ruth and Victor—applied repeatedly to be “repatriated’ to Israel. In October 1970, 23-year old Ruth together with three young Jewish men were arrested in Riga, charged with anti-Soviet propaganda and sentenced May 1971 to one to three years in the Gulag. Rivka was allowed to leave for Israel with her son Victor in April 1971. During the early 1970’s, Rivka and her sister, Lea Slovin, were leaders of the Action Committee of Newcomers from the Soviet Union. I was elected chairman of the UCSJ and established the national office in Cleveland during my four-year tenure. The UCSJ grew rapidly — by 1971 to 10 member councils; by 1972 to 16 (including two Canadian councils); by 1973 to 18; and by 1985 topped out at 32. In 1972, in support of our political activities, I supervised the opening of a Washington, D.C. office, staffed by one salaried employee who acted as Congressional and media liaison.